At last, one proper Sherlock Holmes London evening, the unmistakable smell of gas came to Pirate from a dark street lamp, and out of the fog ahead materialized a giant, organlike form. Carefully, black-shod step by step, Pirate approached the thing. It began to slide forward to meet him, over the cobblestones slow as a snail, leaving behind some slime brightness of street-wake that could not have been from fog. In the space between them was a crossover point, which Pirate, being a bit faster, reached first. He reeled back, in horror, back past the point – but such recognitions are not reversible. It was a giant Adenoid. At least as big as St. Paul’s, and growing hour by hour. London, perhaps all England, was in mortal peril! I moved across the cold, wet, foggy city after work. Tired, yet glad the workday was done and I had someplace to go, even if it was only a weekly bookstore discussion of the giant, confusing tome, Gravity’s Rainbow. As I walked from train to streetcar at the midpoint of my journey I looked up at the fog-shrouded tower and thanked the moment of beauty. 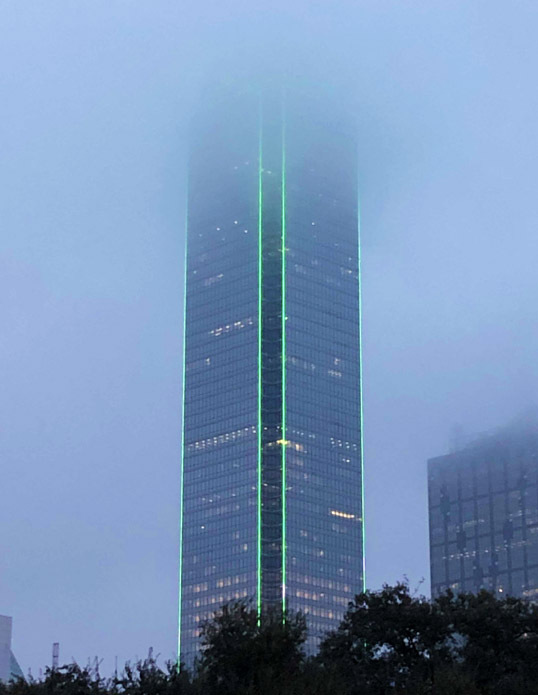 This entry was posted in Photography and tagged bank of america plaza, Dallas, fog, glass, green, Photography, Texas, tower. Bookmark the permalink.